Sewing machines can be extremely versatile tools but they can’t substitute a solid serger. If you sew lots of knits, make garments from more delicate types of fabrics, and want to finish various projects faster and more efficiently, then sergers are for you. Both those familiar with these machines, as well as beginners can find it a bit difficult to choose the right model as the market is flooded with lots of different units, each with its own complex set of functions. You might also want to read my article about the best sewing machine for quilting. This article contains the best sergers for the money as they’ve been carefully selected, their features weighted against their cost to make sure that it’s worth making the investment. Before we go and analyze each serger that made it to this list, it’s important to understand what are the essential features that a high-quality serger needs to have so you can know what to look for when shopping for this kind of machines. These numbers represent the exact number of threads that a machine uses to make a stitch. It’s pretty clear then that a 2/3/4 serger will provide much more stitch variety compared to a 3/4 serger. Initially, it might seem obvious to go for a 2/3/4 variant but it’s not that simple because two-thread stitches are more specialized and for many users, a 3/4 serger is all that they need. Any professional garment maker will tell you that having the differential feed feature is the single most important thing for serger stitching. The reason why it’s a must-have is that it controls the speed at which the material goes beneath the presser foot. But that’s not all as it’s essential for creating gathers and to serge fabrics successfully without pulling. If you want to make a solid investment, it’s recommended to look for a machine that has this feature. Because with a serger you’ve got more threads to deal with, you will need a bit of extra time to get used to the more complex threading process. Manufacturers can offer a helping hand by integrating colored thread paths and handy printed charts. They can also include instructional DVDs in the package but if you still have troubles, you can always rely on numerous YouTube videos. Without further introductions, let’s move over to the bigger section of this article where you can see the best sergers for the money currently available on the market. They each have their own review, where I’ll go a bit more in-depth to help you make the right decision and get the best serger for your needs. The Singer ProFinish represents one of the most advanced sergers you can find on the market. It comes with 4-3-2 thread capability and offers a large selection of stitch options to suit multiple types of projects and deliver excellent results every time. This one is sure to save you a lot of time with seams, hems, and seam finishing. The price is also extremely affordable so this sure looks like a great option. Any serger worth its cost must have a differential feed. It’s an essential feature that you can find in this model. It’s fully adjustable to guarantee that even feed is distributed for perfect seams on every fabric. You will not have to worry about puckering or breaking. A movable upper knife has been integrated to prevent the trimming of fabric while sewing. This model has 2-3-4 thread capability and the six different stitch types will ensure that your project has the best stitches. Going through your projects can be a very smooth process considering the fast speed of 1300 stitches per minute of this machine. When sewing a variety of fabrics, it’s essential to be able to adjust the tension accordingly and this serger can do that easily. Because threading can often be more difficult for a serger, Singer uses a color-coded lay-in threading system to make this process a snap. Simply follow the color-coded diagram that’s printed on the machine. With a turn of a knob, you can adjust the stitch length and width to your liking. In the free arm accessory storage tray, you can store the included accessories such as the needle set, spreader, screwdriver, tweezers, and dust cover. On the machine there’s also an all-purpose foot. When you consider everything about the Singer 14CG754 ProFinish serger, the conclusion becomes clear. It’s fully worth the money. It has all the essential features that you could need if you’re a beginner. You can also be pleasantly surprised by the sturdiness of the machine and once you get used to the speed of the unit, considering that it’s faster than a sewing machine, you can work very well with it. 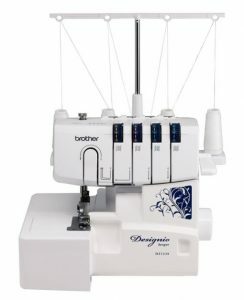 The Designio Series from Brother has received a lot of praise from serger users and one of the best models from this line is the DZ1234. A reliable and efficient machine, it comes with lots of useful accessories like the gathering foot, piping foot, blind hem stitch foot, and two sets of starter thread to have everything needed for customizing the finishes on your designs. Saving time when sewing is important for a serger and this model can sew up to 1300 stitches per minute which is fast enough to create beautiful projects with nicely serged seam finishes. Adjusting the stitch width can be done with the help of a dedicated knob. You can choose values between 3.0mm and 7.0mm to find the best stitch width for working with different kinds of fabrics. An important tool that you will find on this serger is the differential feed which has a ratio of 0.7 to 2.0. It will enhance the stitch quality of various types of fabric and it will ensure that you get the right finishes on specialty fabrics. Another great feature of this serger is the free arm/flat bed convertible sewing surface. Accessing some areas of your designs can be difficult but now you can finish your runway look with cuffs and sleeves more easily. The removable table section can help with the serging of cylindrical pieces. The threading has been simplified thanks to the color-coded thread system which eliminates some of the struggles of this process. Both upper and lower looper threading is easier and the tension control is more precise. Enjoy quick thread changes for basically all thread types. The machine runs very well and the speed is simple to control. For the money this is a great serger. The Brother Designio DZ1234 can be the perfect companion for many users who want to make a good investment in a quality unit that you can depend on. Considering everything about it, it’s highly recommended. If you’re on the hunt for a more premium serger, the Juki MO654DE should be more up your alley. This machine delivers professional seams and can deal with more time-intensive finishes with ease. 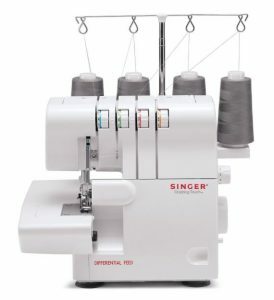 It’s a 2/3/4 thread serger that provides a strong knife system, color-coded threading, and automatic rolled hem. With the help of the color-coded guide, the threading process will take only a few minutes. The lower looper is particularly easy to thread, there’s no more squinting to look if you threaded correctly. The tension is easy to adjust on this machine as it has all the needed dials on the face of the unit. On the “4” setting most fabrics should have no issues. The instructions aren’t very intuitive but you if you aren’t sure how to adjust the tension for a certain fabric you can always check tutorials online. One of the best aspects of this serger is the simple cleaning process. Getting in the heart of the machine with a brush is easy as the front and side swing out. The motor of the unit is safely concealed so you can use work without the risk of blowing lint in there. Something that will definitely be appreciated by many people who work with these machines is the quietness. Compared to other models on the market, this one doesn’t make as much noise. If this is also a factor to consider for you, this machine covers this issue well as it doesn’t make the whole room rattle while you’re sewing. There are other great things about this machine. The built-in roll hemmer will make things less complicated when you want to create a narrow edge. A differential feed will guarantee that your seams will always come out smooth no matter if you’re working with knits or wovens. Seams can be stabilized thanks to the addition of a groove for twill tape found on the included foot. Taking everything about the Juki MO654DE serger machine into account, it becomes obvious that this machine is worth your money. It runs flawlessly and it feels like a very dependable unit besides the fact that it’s so fast and quiet. The price is a bit higher than other models but if you want a more professional look for your seams, it could be a solid investment. Searching for a quality serger machine that offers great value for your money can be a daunting task. 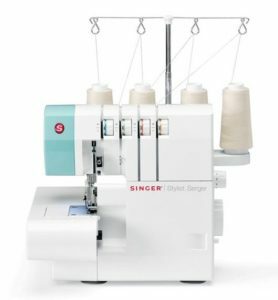 The Singer 14SH764CL Stylist has the potential to end your searchings as it seems to encapsulate all the best features that you’d wish for in a serger while keeping the price in a reasonable range. This serger can be the ideal complement to a sewing machine. Obtaining great finishes is possible as you can choose from various stitch types including blind hems, flatlocking, rolled hems, overlocking stitches, and more. The 4/3/2 stitch configuration coupled with the fast 1300 stitches-per-minute speed can revolutionize your creative work. What’s nice about this serger is that it’s also a very portable unit. The design is more compact than other models and the addition of a carry handle makes transporting so much easier. You can take the serger to class if you prefer. For those who are new to serging, it’s understandable that they may have some reticences when it comes to the threading process which is more complex than on a standard sewing machine. Thankfully, Singer added a color-coded threading system that’s easy to follow to correctly set up your machine. The guide with comprehensive stitch and sewing techniques will never leave you guessing. The differential feed eliminates stretching and puckering and to keep seams strong you have the options to adjust the stitch length and width as well as the tension for maintaining the right balance of the stitches. Among the free included accessories we can count the needle set, spreader, tweezers, screwdriver, and dust cover. 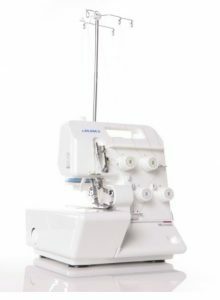 Everything about this serger is excellent, from the threading process and stitch adjustments to the compact design and the handy supplied accessories. If you’re in the market for a solid machine all-around, the Singer 14SH764CL Stylist should be strongly considered when you also factor in the balanced cost. 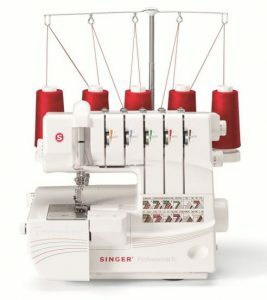 The Singer 14T968DC is geared towards more professional users and it comes encased in a solid heavy duty frame and has 2-3-4-5 stitch capability for extra stitch variety. With a fully automatic self-adjusting tension system, a convenient threading diagram, and precise stitch width adjustment, this model is certainly an attractive choice for a serger. With four built-in rolled hems, you’ve got more hem options at your disposal which is great, especially for lightweight fabrics. Changing to the Rolled Hem sewing mode can be done effortlessly. A lever can be accessed with ease and it moves the stitch finger in position to prepare for rolled hemming. Getting the correct balance for your stitches is a tough job but if you have a more professional machine like this one, the tension system can adjust itself automatically so that you won’t have to worry about this. 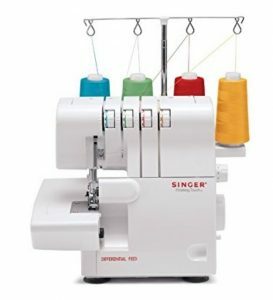 When it comes to threading, Singer is known for providing some of the most intuitive color-coded threading diagrams that even those unfamiliar with this process on a serger machine, can effectively get used to it. The machine feels sturdy to the touch and it really looks like you can depend on it thanks to its heavy duty frame. It’s important to have some patience with it at first and carefully go through the manual which might seem daunting initially but it can deliver a rewarding experience if you take your time with it and learn the intricacies of this machine. This is not exactly recommended for beginners considering the complexity of it. One of the downsides of this machine is that you cannot serge while it’s set in cover stitch mode. This could be an issue for some people but it’s not a huge problem. In 99% of the cases when the stitch has issues or the thread breaks this will be because the machine is not threaded correctly. All things considered, this machine is capable of doing a great serging job but you have to learn how to use it correctly. For those who want to get on a more professional level, the Singer 14T968DC Professional is recommended. Juki is a well-known manufacturer of sergers and their MO644D portable machine is a faithful workhorse using a dedicated drive cutting system and is capable of forming high-quality stitches. 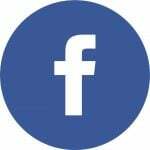 There are lots of features to get excited about in this model and considering the price bracket in which you’ll find it, the initial impression is a highly positive one. The first thing you will probably notice about this machine is the compact design which is the result of first-class engineering. This unit was clearly built to last and is fitting for users who value reliability even if they want a less expensive option. Because of the addition of a differential feed, you have the ability to stretch the material while serging or setting the differential the other way to enable gathering on softer weight materials. By swinging out the left cover, you can set the differential while you will also receive access to the adjustment clamp. While the side cover is swung out, you can also adjust the stitch length and the cutting width. Thanks to the easy dial knife adjustment of this machine, the upper knife is fully self-adjusting for extra convenience. There’s also an automatic rolled hemming that makes it much easier to hem without having to change the foot or plate as it has built-in fingertip control. This Juki serger has a multi-purpose foot which comes with a slotted tape guide. You should have no issues sewing woven tape, elastic, ribbons, and sequins. For consistent tension adjustment, you can always rely on the 1-rotation thread tension dials. This model is a solid choice for those who want a nice quality serger that runs very smoothly. It’s intended for those who sew mainly the same material types. 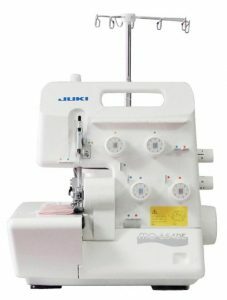 Priced very competitively, the Juki MO644D is a performant serger that takes a bit of practice and patience to work well. The materials are of solid quality, the machine can be easy to use, and overall this serger is a valuable investment. The Janome 8002D serger promises superior value for its cost and fast finishes for your seams. It comes with external color-coded tension dials for hassle-free threading and thanks to the rolled hem changeover device you can easily convert to a rolled hem. This serger can make a real difference in your sewing. As with some other models on this list, this one comes with differential feed adjustment. It has a sturdy mechanism that feeds reliably and smoothly on all types of fabrics. You can make adjustments from 0.5 to 2.25mm with the help of a dial and this can significantly minimize the stretching or puckering that can appear on other sergers. There are two feed dogs used in the differential feed system. One feeds the right amount of fabric according to the setting on the stitch length dial. The other pushes or pulls the fabric according to the way you set the ratio on the differential feed dial. Woven fabrics or puckered edges can be prevented if you set the dial of the differential feed somewhere between 0.5 and 1.0. If you’re worried about stretched edges or knit fabrics, you can avoid them by setting the same feed dial between 1.0 and 2.25. Usually, when you want to go from regular serging to a rolled hem you have to remove the needle plate but Janome added a simple rolled hem conversion so you no longer need to do that. Threading is handled with more ease thanks to the dedicated color-coded chart and dials. In terms of design, this serger is quite compact. It definitely feels like an upgrade to your sewing space and not making it seem like you’re sacrificing valuable table space as this is not a huge serger. Sergers are important for providing the final step for your sewing projects – to finish seams and to get quickly rolled hems. 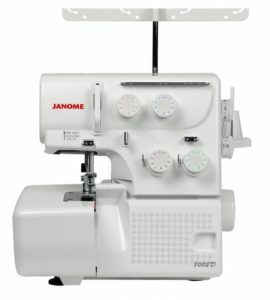 The Janome 8002D is a good candidate for your next serger machine as it will take your sewing to the next level. It can turn difficult projects with knit fabrics into considerably easier ones to handle. For this reason and all the other features and value offered by this model, it’s worth a spot on this list of best sergers. Adding that finishing touch for your seams and table linens requires a capable serger sewing machine. Singer is a brand that you can constantly stumble upon in this industry and it’s not surprising as they have some of the best machines for this job. A solid example is the 14SH6540, a powerful differential feed serger that keeps the price low and doesn’t make too many compromises on performance. This model uses only a 4-3 stitch configuration which is a bit more limited but it’s great for beginners and can handle a few projects ensuring some nice stitches and finished raw edges. It sews up to 1300 stitches per minute which is really fast at this price. Threading is the most overwhelming process for beginners but the color-coded lay-in threading system will make this a breeze. It’s very likely that you will have some difficulties at first on this serger because the process is not well explained in the workbook. You can check some tutorials and videos online though and they can be a huge help. When sewing a knit fabric, the stitch stretches as the fabric does so you will get a much more professional finish that’s stronger and won’t ”pop” when you stretch the fabric. This is all due to the four thread mock stretch stitch. The three thread overlock stitch provides a superb seam finish to help prevent those loosely woven fabrics from unraveling. They can also give you virtually unlimited decorative capabilities. The three thread mock stretch safety stitch is perfect for finishing fine fabrics and also works well for highly stretchable fabrics. Finally, the flatlock stitch is used for making special decorative threads which add some embellishment effects and a better texture. The Singer 14SH6540 is by all means not a perfect machine but it doesn’t have too many flaws. It doesn’t offer as many stitch possibilities when compared to some of the more expensive models on this list but it does a solid serging job and delivers nice performance for the money.